Your safety is very important to us. 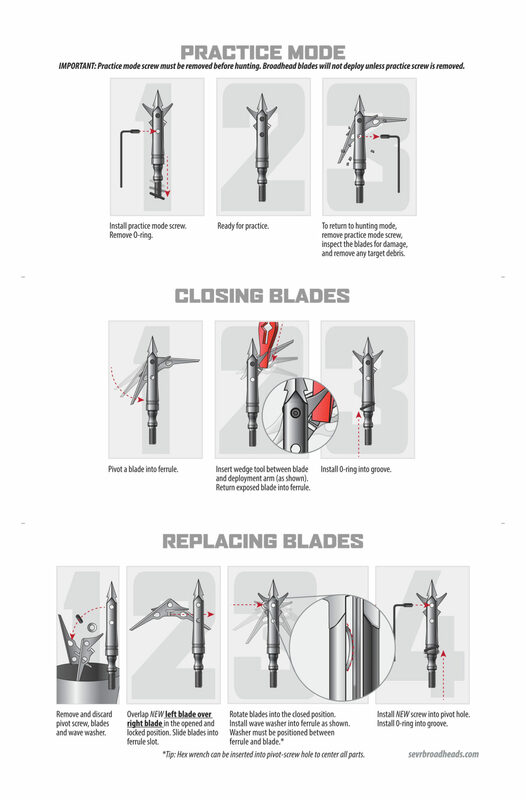 Please review the following warnings and instructions before using SEVR broadheads. WARNING: HANDLE WITH EXTREME CAUTION! This product is designed to inflict catastrophic hemorrhaging and a fast, efficient death to legal game animals. Failure to handle properly will cause serious injury or death.WARNING: This product contains chemicals known to the State of California to cause cancer and birth defects or other reproductive harm. To avoid injury, read the following instructions prior to use or call 801-320-7787 if you have any questions.